Chilly and rich desserts of ice cream, frozen yogurt, and sorbet seem all the more special when they are made in a home kitchen. While this Cuisinart frozen dessert maker is designed to look like the old-fashioned models that require a lot of time and effort, it is actually completely automatic for ease of use and less waiting. 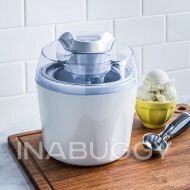 The ice cream maker's base is shaped like a bucket, complete with a carrying handle. The freezer bowl and mixing arm fit within the base and are both removable for cleaning. The transparent locking lid lets cooks watch the maker in action and has an open spout for loading milk, eggs, sugar, and other fresh ingredients right into the freezer bowl without spilling them all over the counter.